So this. I have come to the end of my Slice of Life posts. I’m sure some photo worthy things will happen between now and December 31st but I can’t promise that I will have the time to sit and post about them. (You can always follow me on Instagram, I am @danatreat.) I am hoping to give you some food, some recipes between now and then, but I don’t want to promise things I can’t deliver. I’m curious. What next? Did you like the Slice of Life posts? Should I continue? Should I do something more food related, some kind of round up each week? Would you rather just have more recipes? What do you want to see from me? Your input is most welcome. I appreciate each of you. I am leaving you with this photo of my boys. A typical “please, both of you smile and look at the camera” shots. I love this shot. It is posed but not. They are doing what I am asking (smiling, looking at the camera) and also, not. It shows their personality. It also shows their eyes which, and I may be biased, are amazing. I have brown eyes and Randy has blue eyes. Graham has gray eyes (which you can really see in this photo) and Spencer has hazel eyes. 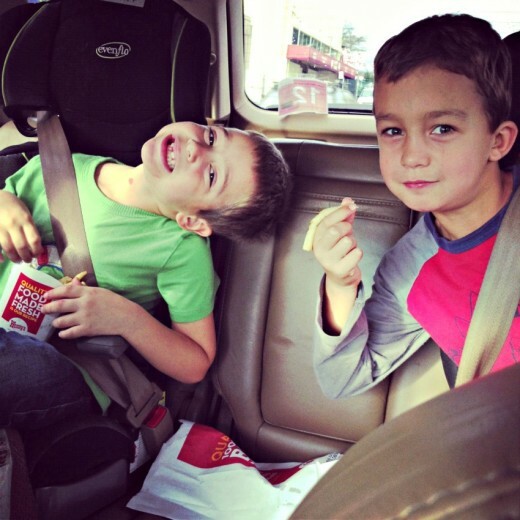 These boys – they fill me up so much. With pride, love, thankfulness and also frustration, fear, and apprehension. You get pregnant and you carry that baby and you have no idea who that person will be. You know you will give birth to someone who will keep you up at night and will require a lot of diaper changes and feedings, but you don’t know who they will be at 8 and 5 5/6ths. Right now I am fielding questions about Rudolph’s role in present delivery and how Santa visits people who don’t have trees and remembering their attempt to say the Hanukkah blessing along with me and feeling lucky, thankful, and blessed. I am hopeful that I can deliver a post or two before the end of the year. Please know that posting on a regular basis is at the top of my New Year’s Resolutions list. I hope you all have a wonderful couple of weeks and the very happiest of holidays to you. You might already know this but we are approaching the middle of December. Fast. I still seem to be under the impression that we are in October. It might have something to do with the fact that it has been sunny and in the 60′s here in Oakland. December, the one that I know, is rainy and in the 40′s. If that. I’m doing my best to get in the spirit. 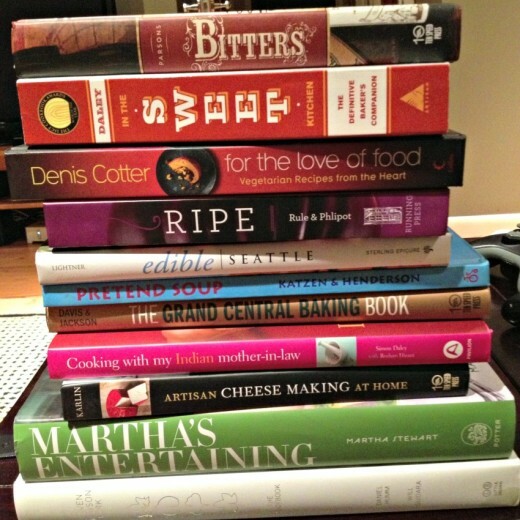 I’ve made up my baking list and am starting to tackle it. We listen to holiday music at night. We have been lighting our Menorah. We went and got our tree over the weekend and spent last night decorating it and setting up an amazing train set that Randy’s parents sent to us. (We are a mixed faith household.) The stockings are hung, we have lights on our house. It just doesn’t feel right to me though. There is not much I miss about our Seattle house, but I do miss how it looked at Christmas time. We had very high ceilings and each year got an enormous tree, one that smelled just like a forest. Our ceilings are lower here, our tree is smaller, and we were not able to hang all the ornaments. It doesn’t smell as good as a Washington tree. The day we cut it down, the boys were wearing shorts. In our old life, I made dinner for my family on Christmas Eve to celebrate my parents’ anniversary and we all opened our gifts that night. It will be different this year. I’m not trying to be Debbie Downer. I have a wonderful life and so much to be thankful for. It’s just moving is hard and the smooth sailing I felt after we first got here has morphed into missing home. But enough sadness and nostalgia. Time to cheer up and time for new traditions. Yes our tree is smaller but when we turn out the lights in the living room, not only do our tree lights sparkle, but so do all the lights in Oakland, San Francisco, and Marin. We can see them all from our cozy couch. 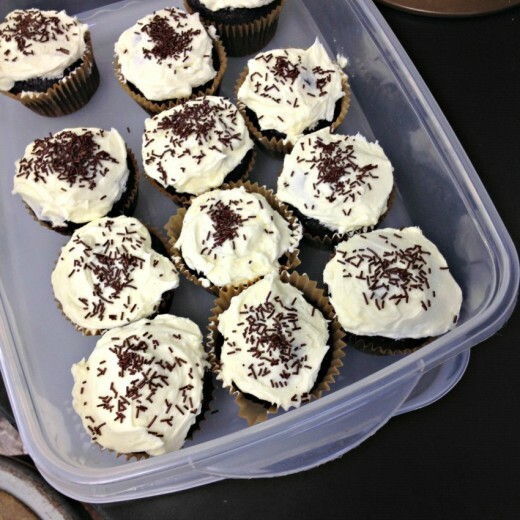 We have been invited to parties with new friends and I have new teachers to bake for. I’d like to know what your traditions are, how you celebrate this season. And I’m giving something away. 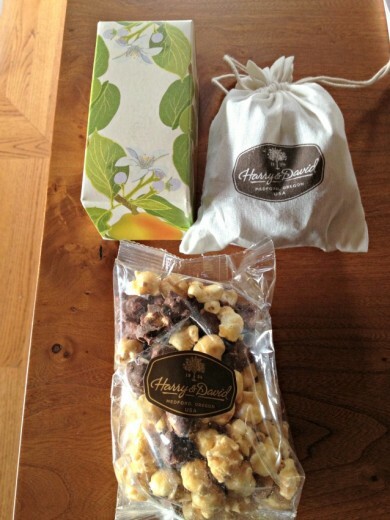 Last fall, I went to visit the nice people at Harry and David. I wrote about my trip here. Since then, I have bought several boxes of pears from them to give as gifts and also just for our family. 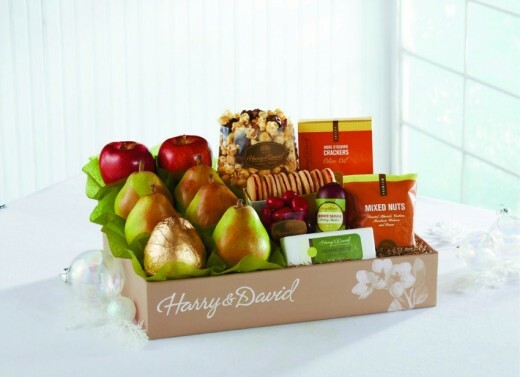 If you have never had a Harry and David pear, they are the best you will ever taste. They are also gorgeous. 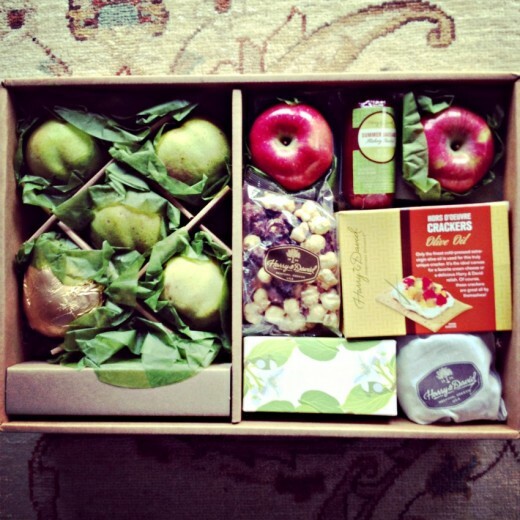 Because they are a generous company, they have sent me a box of Washington apples (the only produce, next to wild mushrooms, that I miss from my home state) and a box of pears this year. And they offered to give away a great box to one of my readers. I got to hand pick which box to giveaway and I chose this one for a reason. This is the Bear Creek gift box and I love it. It offers the very best of the company, in my opinion. Plenty of pears, a couple apples, some savory snacks (nuts, crackers, Rogue River cheese), and some sweet (cookies, chocolate covered cherries, and the all-important Moose Munch). Want one? Just leave me a comment and tell me what your favorite holiday tradition is. I always like learning more about my readers. The winner will be chosen at random on Monday morning around noon. Thanks for being here and for your continued support. Lots of food photos this week. Tuesday, I got to eat lunch at Chez Panisse and Thursday I got to take a food tour of the Gourmet Ghetto, a small area in Berkeley where there is lots of terrific food. Mecca. I met Tracy and Allison there. We had a lovely lunch, the space is so pretty and we had terrific service. I have to say, I was underwhelmed by the food. I know it is simple, I was ready for simple. I like simple. 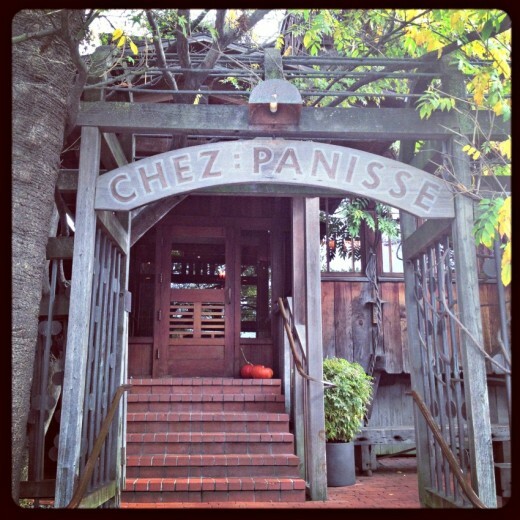 Nothing was bad, just not what I imaged Chez Panisse would be. 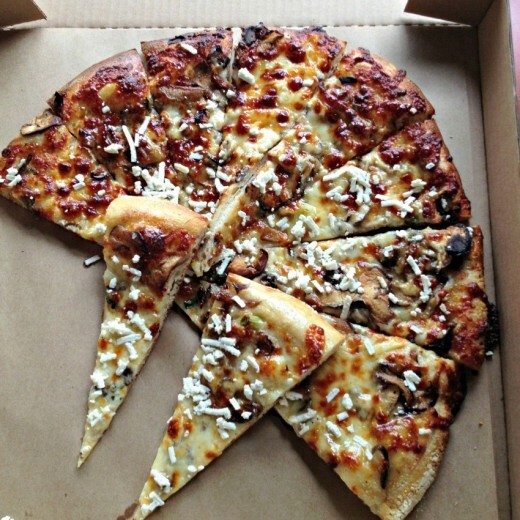 Pizza with wild mushrooms and gremolata. The mushrooms were stellar, the rest was, um, underwhelming. 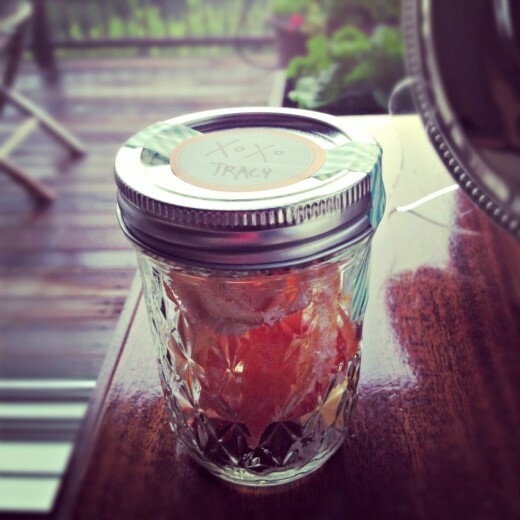 The best part about lunch, aside from the lovely company, was a jar of these of these candied citrus peels. I don’t think I would ever had had the patience to make them myself, so I am grateful to have them! 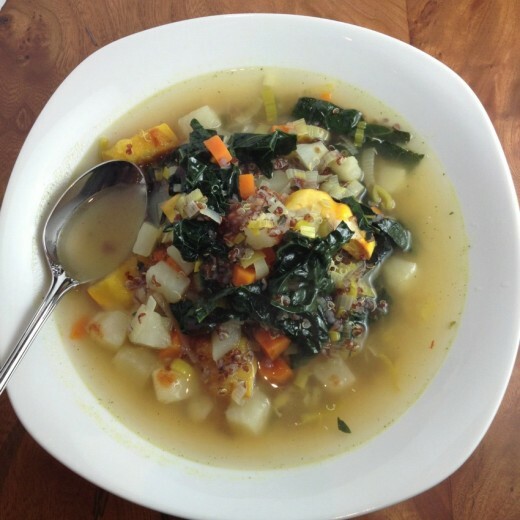 A soup of my own creation – so good I made it twice. I know I owe you LOADS of recipes but this one will be first up. 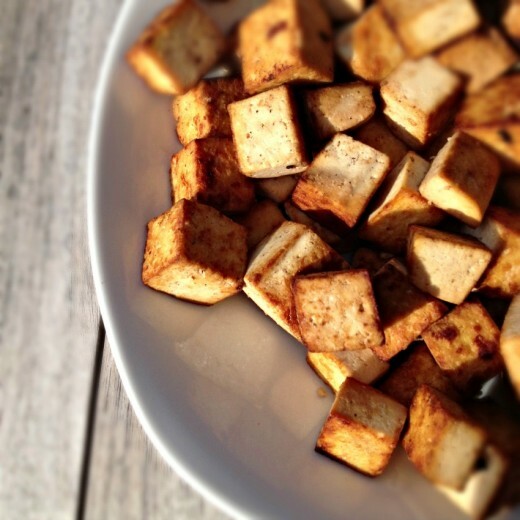 I also sautéed up a big batch of tofu. Tip – use extra firm, marinate in tamari (or other soy sauce) for about an hour. Dry fry in a non-stick pan, taking care to keep turning the tofu so it browns on (almost) all sides. If you think tofu is mushy or flavorless, try it this way. 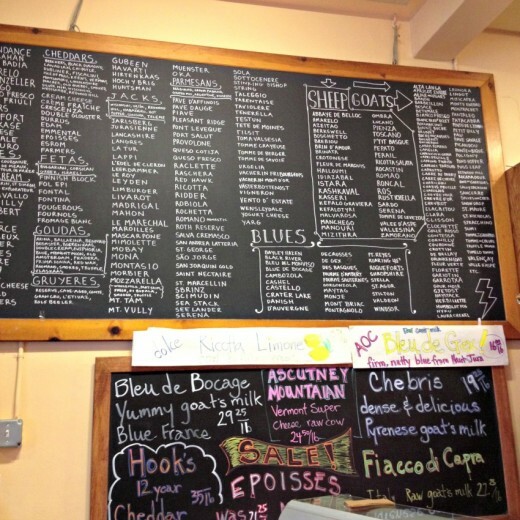 I went on a Gourmet Ghetto tour with Edible Excursions and the amazing Sarah was my leader. 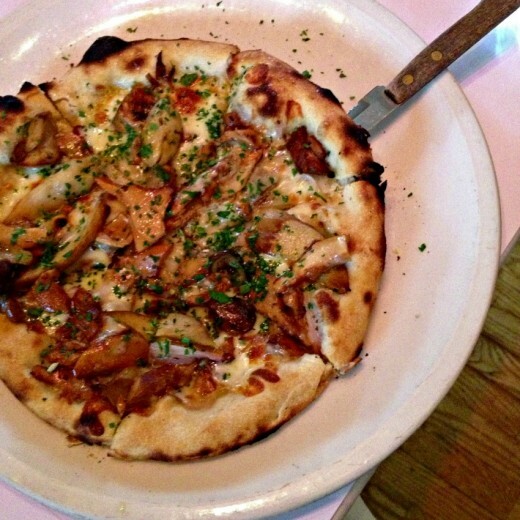 The Gourmet Ghetto is a small few blocks radius area in North Berkeley around Chez Panisse. Many restaurants and food shops have sprung up around there in the years that Alice Waters has been changing America’s ideas about food. The tour was a really nice mix of old traditional places and new start ups and we had many many good bites. I was incredibly full by the end and had learned a lot. 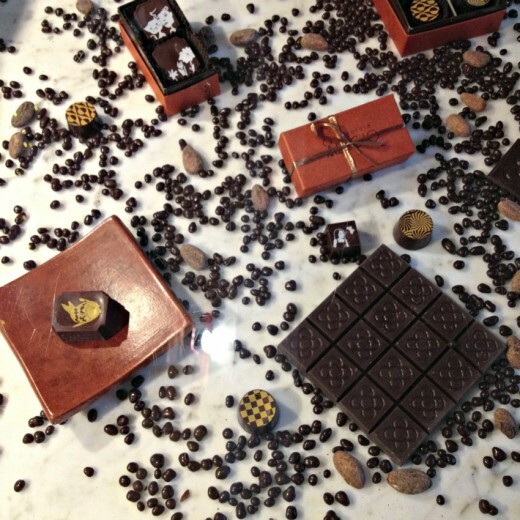 The above photo is of an amazing chocolate tasting at Alegio Chocolate. We had lots of samples but I was blown away by their simple 70% chocolate which only contains cacao and sugar. We tasted it alongside another “premium” chocolate that has vanilla extract in their chocolate and, after Alegio’s, the competitor tasted like perfume. I like ice cream as much as the next person but it surprised me that the best thing I ate all day was the gelato at Lush Gelato. We got to taste as many flavors as we wanted and then got a cup to take outside with us. I tasted every chocolate flavor (because tastes don’t count, right? 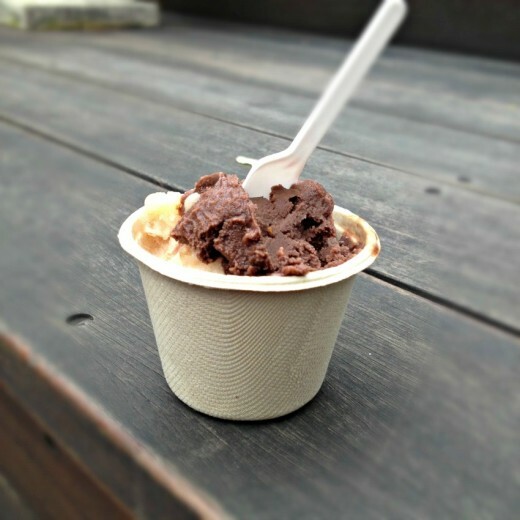 ), then settled on the chocolate orange sorbet and the apple sorbet. 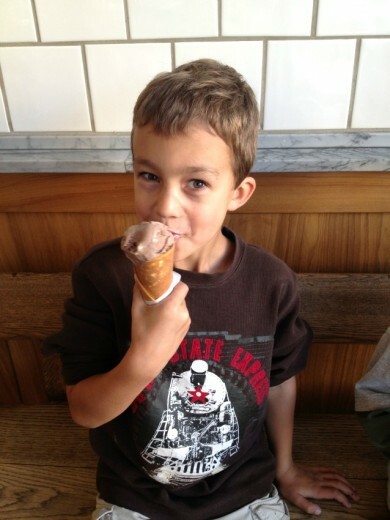 I was totally blown away by the chocolate sorbet – incredibly creamy and very subtle orange flavor. Potato Puffs. 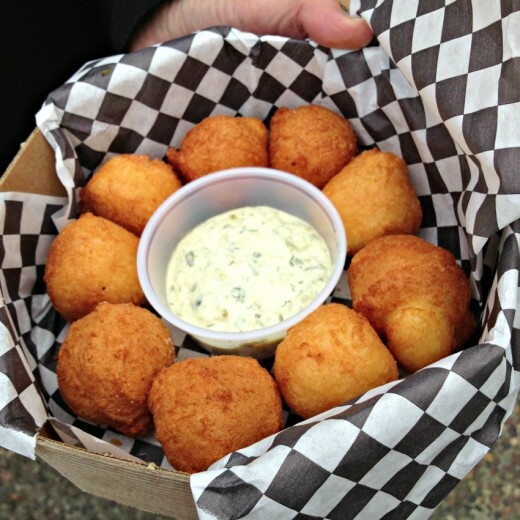 Think fried mashed potato balls with a tartar sauce like dip. Crazy good and addictive. 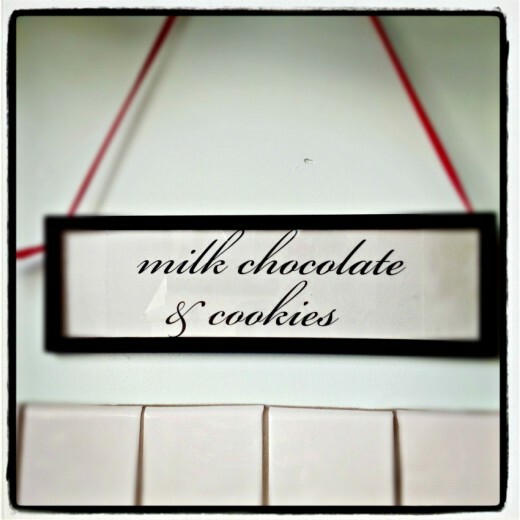 This is the sign at the Cheeseboard Collective. Those are all cheese that are available on a given day. That place is amazing and inspiring. 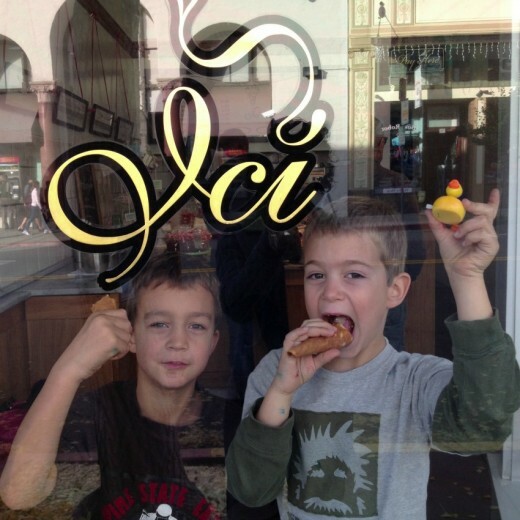 It features a pizza everyday (one that people wait in line for), as well as terrific baked goods. We got to taste their sourdough and it was super sour and crisp. I bought English muffins to take home and some of their pizza dough because, as easy as it is to make your own dough, it’s even easier to buy it. 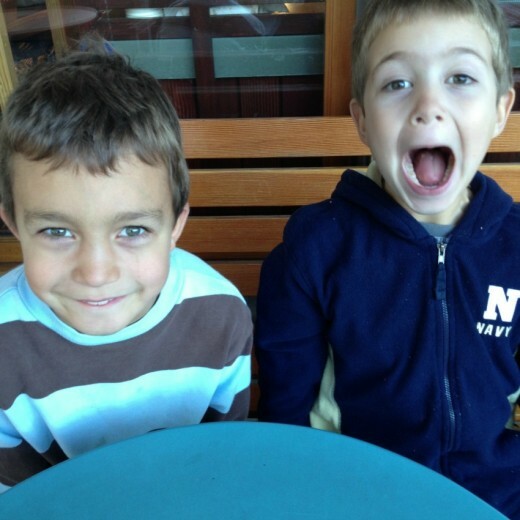 My boys Freaked Out about the muffins. They are amazing. The pizza that day. Mushrooms, ricotta salata, scallions, sesame oil. Doesn’t sound like it should work but it did beautifully. Much better than the pizza I had at Chez Panisse. One of our favorite holiday traditions when we lived in Seattle, was to go to our friends Jenn and Jos’s house. The decorated their beautiful house with incredible gusto and good taste. 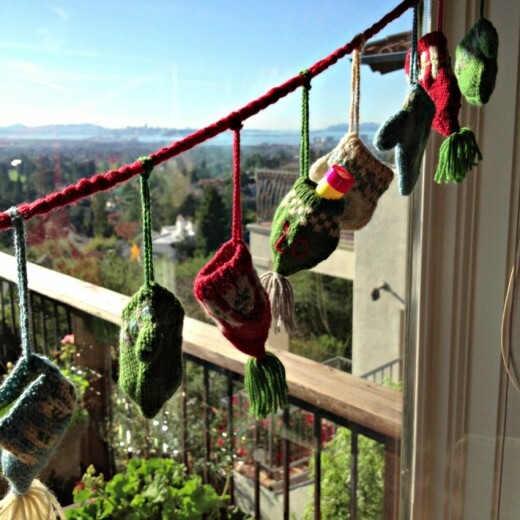 They always strung these little mittens across their fireplace and I was enchanted by them. Each year, I would ask where they got them and each year I would forget to buy them. Jenn and Jos came to visit us about a month ago and they brought us our very own mittens. I was so touched. Each one is filled with a little gift and the boys have LOVED opening them. See San Francisco in the background? I knew I was missing Cheryl’s cookbook on my bookshelf. I didn’t know that I was also missing all of these other ones. Turns out they were all partying together in a forgotten box but are now in their rightful place. 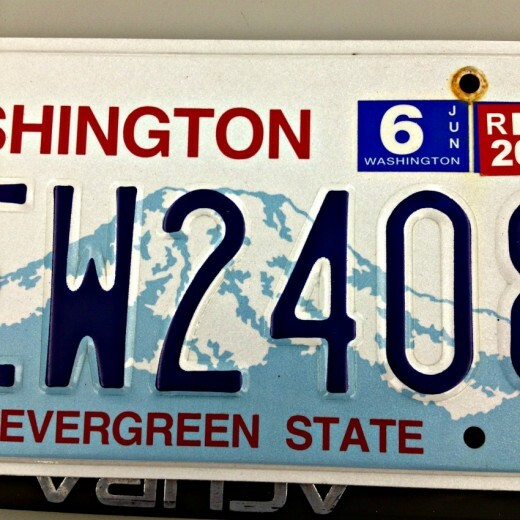 Last week I had to give up my beloved Washington state plates. It was Graham’s birthday. I wrote a post about him. Thank you to all of you who commented or emailed. I appreciate all of you. Birthdays around here mean lots of treats. There was ice cream at the best place in Berkeley. 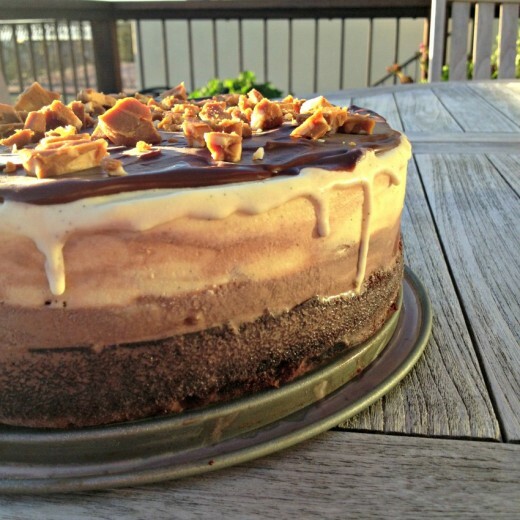 There was a birthday cake with two kind of homemade ice cream, chocolate glaze and homemade toffee. 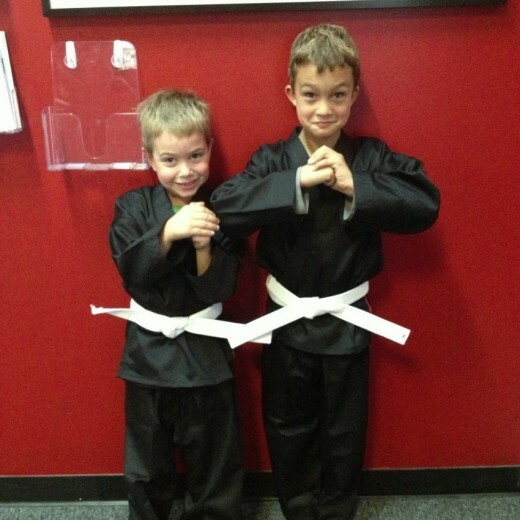 The boys started karate. When they first came out in these outfits, I almost died. They were so proud. 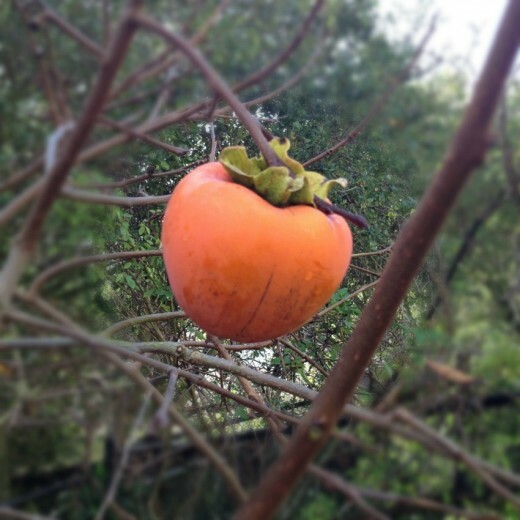 In other news, I have a persimmon tree in my backyard. Unfortunately these are the type of persimmon that need to be super ripe to use and the birds are eating them before I can get to them. 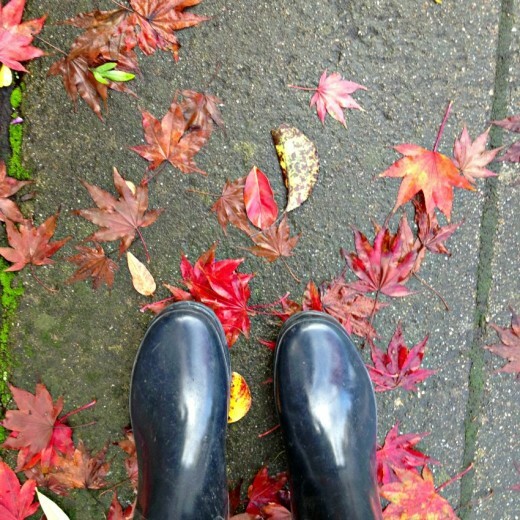 It was a spectacularly rainy weekend in the Bay Area. Like scary rainy. There were rivers off rain pouring off the Oakland hills and puddles the size of small lakes on the streets. Our house held up with no flooding and no leaking. Phew.